Facebook is filled with false memes on just about everything from vaccines to Monsanto. The anti-vaccination crowd fills Facebook with their amusing and highly inaccurate memes, which only leads to people thinking they’ve done their research, and not vaccinating their kids. For more than a year, there have been dozens of photos of bananas with a few words that some Japanese scientists claim that ripe bananas have high levels of “tumor necrosis factor“, so eat ripe bananas to boost your immune system, thereby preventing or curing cancer. Facebook is famous for these things, little pictures with a few words, no sources of the information, and broad conclusions. Eat bananas. Cure cancer. And people share them with a click of the button and move on to the next cute cat picture. It’s really the lazy person’s way of learning. Although who doesn’t enjoy the cute cat pictures? The authors do not make one single claim (as best as I can tell) that there is tumor necrosis factor (TNF, which we will discuss in some detail below) in a banana. No, this article does not say anything about bananas having TNF. Really, nothing else I write about this article matters, because the “Japanese researchers” just don’t make any claim whatsoever about TNF and bananas. That should end the matter, but many of you would like to know why this myth started anyways. The study is in a mouse model, and many animal model experiments just don’t have applicability to human clinical research. The percentage of animal studies being relevant to humans is small, that’s why there’s the old joke that “we’ve cured cancer in mice thousands of times.” So, even if the authors claimed that bananas had TNF (and that would be Nobel Prize winning research), we have no clue as to whether it has any clinical impact. But let’s not forget that the authors make not a single claim that TNF is in bananas. The article is published in a low impact journal. This journal has an impact factor of less than 1.0, which indicates a very low quality journal and it’s not even indexed in PubMed, which further indicates its low value. But again, I need to remind everyone, no matter where they published this article, they did not claim that there was TNF in mice. The bananas are not fed to the mice, and without getting into details about the study, they try to stimulate production of TNF by essentially placing slices of banana in the mouse – of course, there will be an inflammatory response in these mice. Shocking. I am not sure why the authors used bananas, and I am unclear what it is supposed to prove. That it induces TNF activity might be expected since the body would react to any foreign substance (an apple, viruses, bacteria, anything) injected into the peritoneum, and production of TNF might be expected. 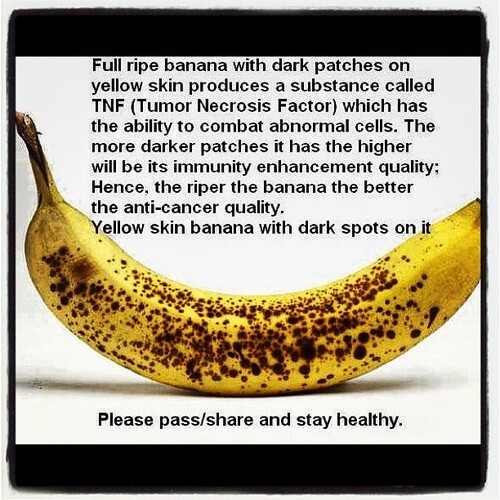 But the TNF does appear from the banana, it is just the immune system’s reaction to a banana injected into the body. Of course, right at this point, someone will try to claim, “see bananas prevent cancer.” No. What is the clinical significance of what was induced? In other words, is there actually TNF isolated from the bananas in a form that actually can do something? Or is there some other effect just because there’s a blob of intraperitoneal banana extract which induces some other immune response? Again, and I’m going to keep repeating it, the TNF did not come from the bananas. No one has repeated this experiment, and certainly no one has shown this effect in humans. There is not a single double-blind clinical trial to show that bananas induce a TNF-alpha response in humans. And I can’t stress this point enough – bananas do not produce TNF. It is simply an evolutionary impossibility, unless through some amazing instance of evolutionary convergence, the banana plant evolved the ability to produce the TNF molecule for a completely different purpose for the banana plant. This would violate several principles of evolution, since there are reasons why the TNF molecule evolved in mammals and not in plants. Just for review–I dug up the original “Japanese scientific paper”, and what I found was essentially simple–the authors did not claim bananas produce TNF, but that wasn’t even the point of the article. The article actually didn’t show much, but it did not provide any convincing evidence that in humans, bananas had any effect on the immune system. Again, unless that human is chronically malnourished. We need to examine this pseudoscience even more carefully, so we will look at them point by point. 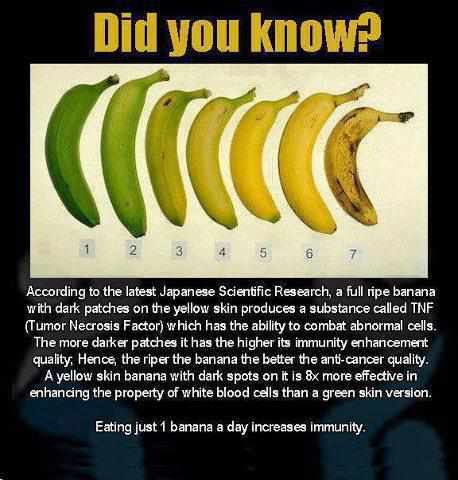 Not to repeat myself a dozen times, but the “Japanese scientists” made no claim that there’s TNF in a banana. Unfortunately, the junk medicine pushers continue to make the claim, facts be damned. The problem is that anyone with a basic comprehension of biochemistry would understand that tumor necrosis factor (TNF) is a fairly complex protein, with a highly specific role in the human immune system (something notably lacking in a plant), so the chances that a banana would have evolved some protein that exactly mimics or copies TNF is so tiny as to be close to impossible. A banana has no need for TNF, since it lacks an immune system of a vertebrate, so evolving a complex protein like TNF would be crazy; in fact, if it did, we’d have to rewrite our understanding of evolution. Let’s make this clear–we don’t have to rewrite evolution, because there is no TNF in bananas. Even if we could assume that a banana makes TNF, the digestive tract would break down the complex proteins and substances, such as TNF, into its constituent components, such as amino acids, simple sugars, and fats, before being absorbed into the bloodstream. The TNF probably wouldn’t survive intact within the digestive tract. The true scientific skeptic would, even if they thought that maybe a banana evolved a TNF molecule by some strange mechanism, know that it could not enter the body. It is just not physiologically possible. Bananas produce small amounts of serotonin (5-hydroxy tryptamine) and dopamine, depending on their stage of ripeness. These can have a stimulatory effect on neutrophils and macrophages in a living organism, and these can in turn produce the touted TNF-a, Interleukin-12 (IL-12) and other cytokines (signal molecules for part of the immune system reaction to antigens). In this role serotonin and dopamine are said to serve as a “biological response modifier” (BRM). In plain English, the stuff in ripe bananas can (but not necessarily will) stimulate a subset of white blood cells to produce chemical signals to deal with a variety of threats. However, this is a small effect, and it will not help you fight off cancer. And remember, this won’t happen unless you directly inject the banana into the gut – it won’t happen if you consume bananas, because all of the components of a banana are broken down in the digestive tract. Unless you, for some odd reason, inject bananas into your peritoneal cavity, they, by themselves, cannot stimulate or boost the immune system unless there’s some chronic malnutrition or disorder where you need to get more nutrition that bananas are adequate in providing. But, in healthy individuals, only vaccines can boost your immune system. But let’s pretend that TNF is produced in bananas (it doesn’t) and it can pass intact into the bloodstream from the digestive tract (it can’t), it would require eating hundreds of bananas to get a blood level of TNF that would actually have a biological effect. And even if TNF killed cancer cells (it doesn’t), how would your body “know” how to move the TNF to the cancer (it can’t). And which one of the 200 or so cancers would it effect, each of which has a different etiology, pathophysiology, and prognosis? Moreover, the body would start down-regulating TNF in response to excess TNF in the blood, because TNF doesn’t do what you think it does. The name, tumor necrosis factor, seems to imply that it kills cancers (it really doesn’t). I would have to write a 20 page paper just to describe how TNF is up and down regulated within the immune system both locally and generally in response to a wide variety of immune challenges, including cancers. It is incredibly complex, and the name is simply one given without consideration to future alternative medicine pushers who jump on it as the the “cure” to all cancers. It isn’t. Of course, all of this leads us to what TNF actually does. It’s part of the inflammatory response, so TNF is associated with autoimmune disorders such as rheumatoid arthritis, ankylosing spondylitis, inflammatory bowel disease, psoriasis, hidradenitis suppurativa and refractory asthma. Seriously, you don’t want more TNF, and you certainly wouldn’t want to consume something that would cause an increase in TNF. In fact, if bananas could do all that was claimed here, it would be banned! And one more thing about this annoying “boost the immune system” myth. The immune system is an incredibly complex system, with an almost infinite number of interactions between various proteins, compounds, organs, factors, immunoglobulins, receptors and cells. As long as you’re healthy, so is your immune system, there is nothing you can do to make it stronger, better, or “boostier.” As I’ve said, vaccinations actually do boost the immune system, and they rely upon an appropriate immune response. The “Japanese scientists” did not claim, nor show, that there is a protein called tumor necrosis factor in bananas. These scientists did not show that eating bananas could induce production of TNF. Even if bananas contained TNF, your digestive tract would destroy the TNF, breaking it into constituent molecules. It would have no effect. But even if it could pass through the digestive tract and enter the bloodstream, you couldn’t consume enough bananas to raise your blood level of TNF to actually have a biological effect. And even you could raise your blood level of TNF, it’s name is a misnomer, since TNF doesn’t cause tumors to necrose. TNF, in fact, causes the inflammatory response, and numerous autoimmune disorders. You really don’t want to increase TNF. And if you consumed that much TNF that you think is in bananas, you’d die. So sure, the cancer is dead. But so are you. There are a few ways to actually prevent cancer, like not smoking. Consuming bananas is not one of those ways. If you want to eat a banana, go ahead. It does have some benefits I’m sure. But rest assured that as much as you want to believe that bananas prevent cancer, the evidence does not support it. It’s not ever going to cure cancer. It’s not going to do make you live longer. It’s just going to provide nutrition. Editor’s note: This article was originally published in June 2014. This article about bananas prevent cancer is a rewrite of one I published almost four years ago, and that was subsequently written into a new article. It is by far the most popular article I’ve ever written with well over 1 million views.